On Fridays, whenever we not felt like cooking, custom burgers at The Counter were always our number one choice to eat. We loved their custom-style burgers, where you can pick and choose sides, cheese, toppings, sauces too. I always wanted share our good experience with you all, but, never got chance. Recently, we decided to dine at The Counter again and to our surprise, we found, all The Counter restaurant franchise in San Diego area has been closed. I was so disappointed, we loved their burgers, economical menu, fresh ingredients and style of serving too. 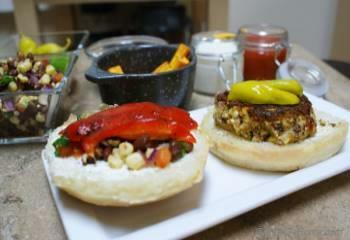 Craving for my custom burger plate, last weekend, I decided to make burgers the same way we used to get at The Counter. 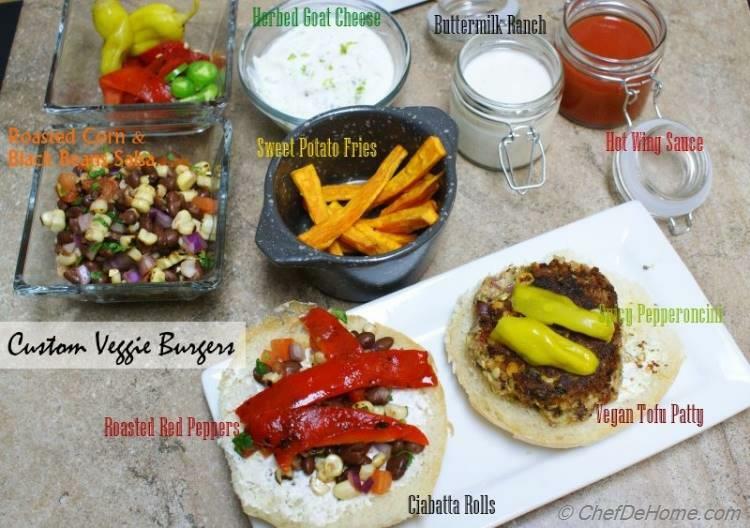 Presenting to you, my experience of custom burgers, with vegan, tofu, rice and beans patty and some of my favorite zesty, spicy and juicy condiments. Make this custom experience your own. 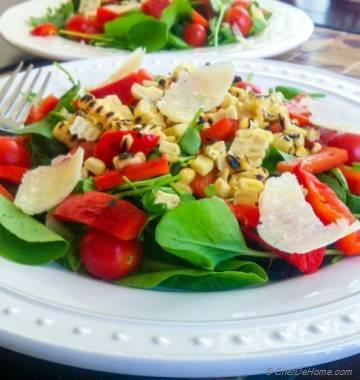 Try adding toppings or condiments of your choice. Fried eggs, fried onion rings, fresh sprouts, cranberries and fresh spinach were few other toppings I love on my custom burgers. 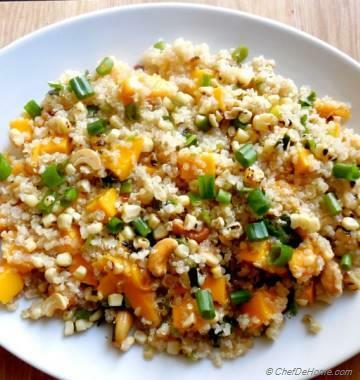 In this recipe, I am sharing few of my most wanted toppings and condiments. 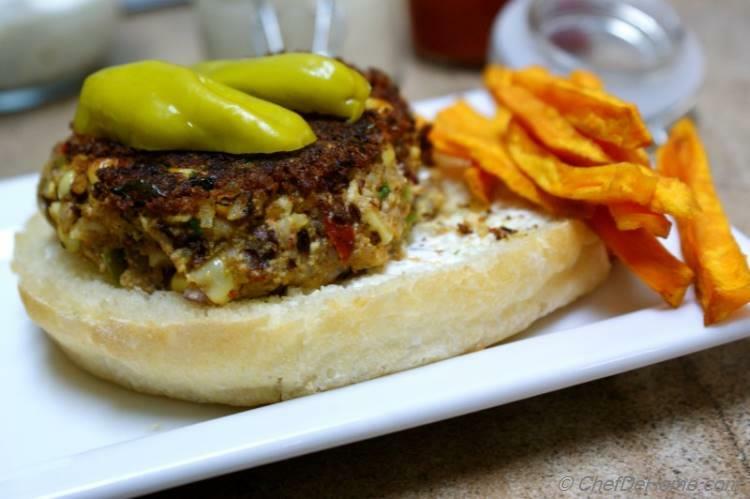 Meaty, hearty and healthy Tofu-Rice patties will sing in your mouth with sweet roasted red peppers, spicy pepperoncinies, mild and smoky roasted corn and beans salsa & with tangy herb goat cheese spread . Y U M M Y!!! 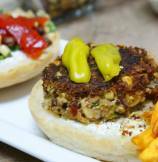 This is, the best, family-style or party friendly burger serving idea ever!! I miss Counter's Custom Burgers a lot and this is my way of eating'em at home. 1. 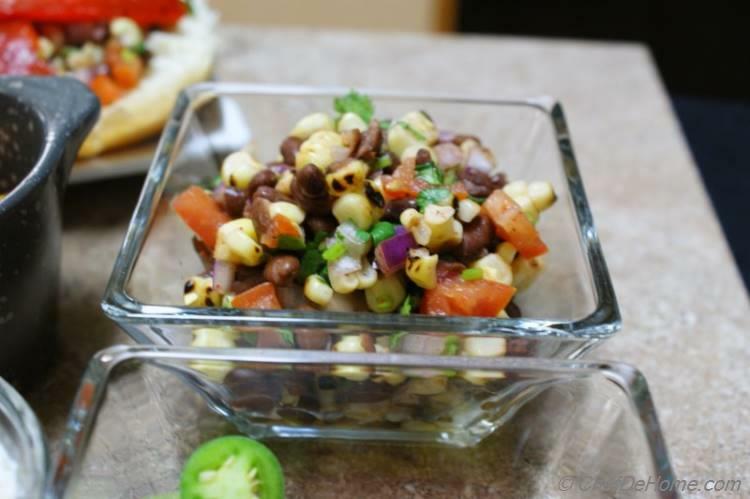 Roasted Corn and Beans Salsa - Roast both corns on open flame, let it cool down. While corns are cooling, rinse canned black beans and divide among two small bowls. When corn has cooled, slice off the kernels from corn and divide among two bowls. 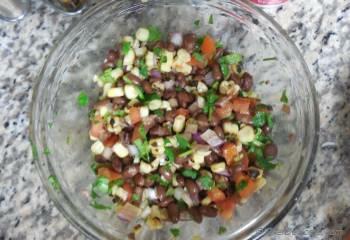 In one bowl add 2 tbsp cilantro, diced tomato, juice and zest of one lime. Mix, season with salt and pepper. Salsa is ready, keep it aside. 2. Veggie Patty - In other bowl, add cooked and cooled rice, 2 tbsp chopped cilantro, crumbled tofu (pat dry tofu so that it should not have no moisture), cumin powder, 1/4 tsp red pepper powder, salt and pepper per taste. 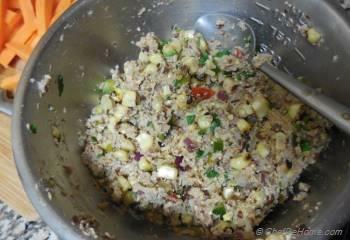 Mash ingredients with potato masher until every thing mix in well and is slightly mushy. 3. 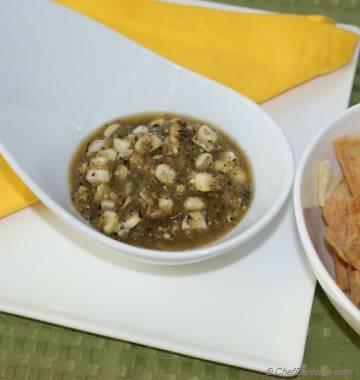 Condiments - In a small bowl, mix in room temperature goat cheese with 1 tbsp water, 2 tbsp chopped cilantro, zest of one lime, 1/4 tsp red pepper powder. Beat well and keep aside. 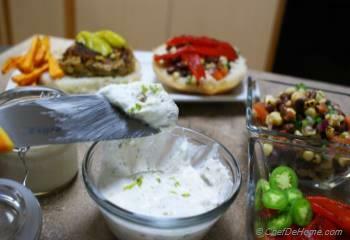 Also mix in 2 tbsp ranch spice mix into buttermilk, mix well, taste and season with salt and pepper per taste. 4. Cook Burgers - Heat 2 tbsp oil in a non-stick pan. 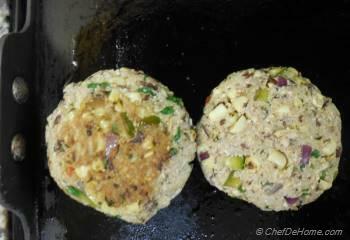 Make 4 medium size balls from rice, beans and tofu mixture. Pat'em slightly and then place burger patties on hot skillet/pan. let'em sear undisturbed on 1 side for 3-4 minutes until nice and crisp brown, then flip with flat spatula and cook on another side for 3 minutes. 5. Assemble and Serve - These burgers are best served custom style with all condiments on side and plate full of burger patties and sliced ciabatta rolls (toasted, if you prefer). 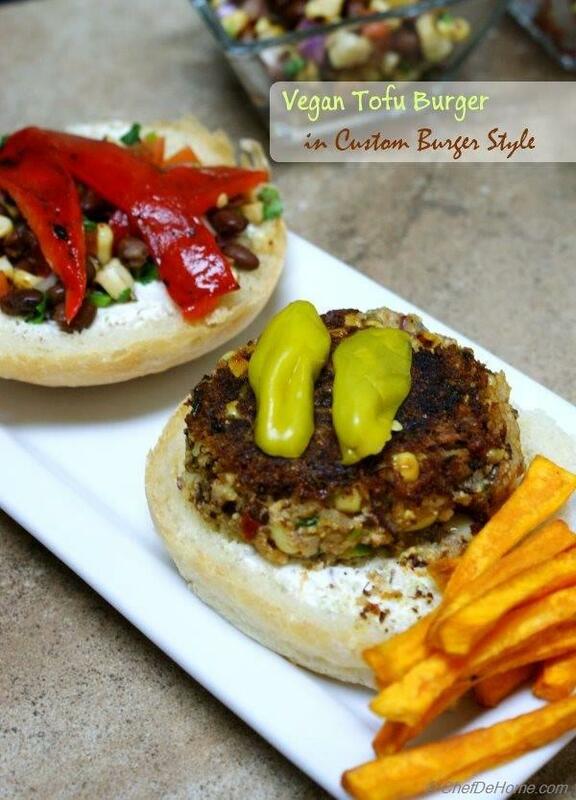 Let your guest interact and make their burgers the custom style. Enjoy!! For sweet potato fries, please follow the sweet potato fries recipes from pairings below. NOTE: Tofu Burger is Vegan, all condiments are vegan except herb goat cheese, buttermilk ranch and hot wing sauce.